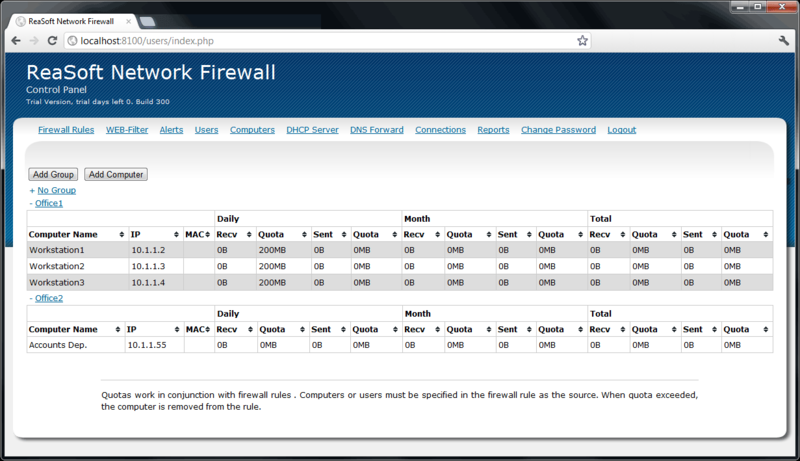 ReaSoft Network Firewall allows you to count the traffic used by clients and also to limit its usage with quotas. To be able to count traffic, you need to set a rule where you specify the protocol, the client to count traffic for and client connection destinations. When connections going through the ReaSoft Network Firewall server are processed, traffic will be counted for all rules the connection matches to. If you need to limit traffic for your users, you should use quotas that are specified in traffic usage rules. When a traffic usage rule reaches one of the specified quotas, the operation specified in the quota will be performed. You can block the connection or send a notification about exceeding the quota. It is possible to specify any number of quotas for one traffic usage rule.